PerioBrite Natural Toothpaste is among one of the more popular natural toothpaste brands. Even holding their own easily, against the bigger commercial brands. It is currently hanging out at 4.3 stars on Amazon, as well as sports their badge for Amazon's Choice. Let's check out and see why this toothpaste is so popular. PerioBrite Natural Toothpaste is a Fluoride free toothpaste. The reasoning behind the elimination of fluoride is because fluoride is considered toxic to the body, but only when ingested at low to high amounts. However, it is also a big ingredient that prevents tooth decay and cavities. And since toothpaste is not meant to be swallowed, the addition of fluoride has been standard in toothpastes for decades. The biggest case for fluoride-free toothpastes is when there is a small child in the equation. Children tend to eat just about anything. So if they were to accidentally swallow their toothpaste, it could potentially be toxic to them. 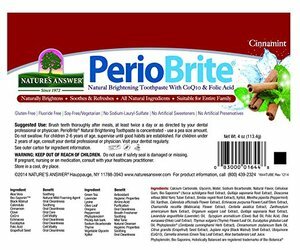 Like the name says, PerioBrite Natural Toothpaste only contains all natural ingredients. In fact, they say that you get a 45 year promise with each purchase. So they put a lot of passion behind their natural products. The ingredients for PerioBrite Natural Toothpaste are as follows: Calcium carbonate, Glycerin, Water, Sodium Bicarbonate, Celluose gum, Bio-Saponins (Yucca schidigera Root Extract, Quillaja saponaria Root Extract, Dioscorea villosa (Wild Yam) Tuber Extract, Smilax regelii Root Extract), Mentha piperita (Peppermint) Oil, Xylitol, Lysine, Xanthan, Calendula officinalis Flower Extract, Echinacea purpurea Floer/Leaf/Stem Extract, Chamomilla recutita (Matricaria) Flower Extract, Centella asiatica Extract, Zanthoxylum americanum Bark Extract, Origanum vulgare Leaf Extract, Lavandula angustifolia (Lavender) Oil, Syzygium aromaticum (Clove) Bud Oil, Folic Acid, Olea europaea (Olive) Leaf Extract, Thymus vulgaris (Thyme) Flower/Leaf Oil, Eucalyptus glovulus Leaf Oil, Phytoplenolin, Cinnamomum zeylanicum Bark Oil, Citrus grandis (Grapefruit) Seed Extract, Juglans nigra (Black Walnut) Shell Extract, Ubiquinone (CoQ10), Camellia senensis Leaf Extract (Green Tea), Aloe barbandensis Leaf Juice. The brightening and whitening of PerioBrite Natural Toothpaste comes from the Folic Acid and the CoQ10. Both of which have been shown to be natural alternatives to whitening chemicals used in commercial brands. However, there is one ingredient that is troubling to see. Glycerin. While there is a lot of controversy around this ingredient, same as fluoride, most natural toothpaste brands have opted to not use this ingredient. The whole issue raised with glycerin is that many places will say that it leaves a thin layer of film on your teeth that keeps them from remineralizing. However, there are many other places online that will say the opposite. The fact of the matter is that glycerin dissolves in water, meaning that there is no way that it could leave that film over your teeth. However, glycerin does not dissolve in oil, which PerioBrite includes various types of oils to make up its flavor and other health beneficial properties. Since I am not an expert of chemistry, I am not going to say whether glycerin is good or bad for you. Basically, it is used in toothpaste to keep the toothpaste from drying out, since glycerin is highly hygroscopic and absorbs water from the air. Also, while a lot of products use synthetic glycerin, PerioBrite does use natural occurring glycerin, so regardless of the addition of this ingredient, it does keep the total toothpaste natural. You can do your own research and make your own choice. PerioBrite Natural Toothpaste has a rather unique way of assuring you of the quality of the plant based products in this toothpaste. It is called Nature's Answer Advanced Botanical Fingerprint Technology. This is done by one of the most comprehensive collections of plant specimens in the world and identifying each of their distinctive botanical fingerprints. This way, Nature's Answer can compare and analyze the quality and purity of every incoming botanical used to formulate their products. Assuring you that everything is of the purest, highest quality possible. There are many benefits to using PerioBrite Natural Toothpaste. For one, the ingredients used can promote the wellness of your tissue and gums, which is very important for anyone with sore or tender gums. Also, for those who care about all of the products they use being of the same stuff as their food, this natural toothpaste is soy-free and vegetarian. As well as being cruelty free, which means that it was in no way tested on animals. In addition, Nature's Answer has a special way of acquiring their raw plant materials. It is called the Bio-Chelation process. During this process, the materials are "cold-extracted", which prevents the materials from coming in contact with high levels of heat. This preserves the holistic balance of the herbs and ensures that they retain all of their nutrients and healthy properties. PerioBrite is made by a company called Nature's Answer. Nature's Answer started back in 1972, by Frank D'Amelio Sr. Since the founding of Nature's Answer, the company has had a passion for healthy living, along with an interest in the healing powers of plants and herbs. Nature's Answer owns and operates North America's most extensive pharmaceutical licensed herbal manufacturing and quality control facilities, located in Hauppauge, New York. Their state-of-the-art facility houses a manufacturing operation, R&D Lab, QC Department, Microbiological Lab, and a Modern Warehousing Complex. All of which are pharmeceutically licensed, Kosher-inspected, NSF certified, and Organic Certified. Their team includes natural product chemists, pharmacognosists, microbiologists, formulation chemists, and herbalists. They have specialized in Botanical Extracts for over 45 years. Some of their unique processes include: Advanced Botanical Fingerprint Technology, Proprietary Process for Superior Herbal Extracts, Sourcing the Finest Herbs, Water- The Purest Available, and exclusive patents on natural materials. Nature's Answer has a ton of products that are all based around their core principles of natural remedies. Besides toothpaste, they also manufacture various vitamin supplements that help your entire body, herbal remedies for everything inside your body, personal care products like superfoods, essentia oils, cognitive betterment, and so much more. If you need something, Nature's Answer probably has it. PerioBrite Natural Toothpaste is contains only the best natural ingredients. This is thanks to their Advanced Botanical Fingerprint Technology. They also are free of artificial preservatives, SLS, fluoride, and gluten. This natural toothpaste is gentle enough for sensitive teeth. In addition, many of the ingredients promote tissue and gum wellness. Besides the good and healthy properties of this toothpaste, it really works. The folic acid and CoQ10 really do help to whiten your teeth and make your smile brighter. There is a really impressive company behind this toothpaste. Nature's Answer is not only passionate about natural health, they are full of extremely smart people who really know what they are doing. For the paste 45 years, they have manufactured and improved their various products, all to better you. The only controversial ingredient they feature is glycerin. While there are many different views on glycerin, most natural toothpaste brands have opted not to include this. However, even though PerioBrite Natural Toothpaste includes glycerin, it is naturally occurring glycerin and not synthetic. So there is that. Many customers have complained about the smell of the toothpaste and also the texture. They have said that it does not smell fresh and it very hard to get out of the tube. Very few have complained about the taste, which is surprising. But the complaints revolve around the bad smell and weird look of the toothpaste. I apologize if I am gushing about the company but to be honest, it is extremely impressive. The amount of work and time put into their product is very impressive. It is hard to believe that anything they put out would be anything less than awesome. While many complain about the look and smell, those are rather objective opinions. Everyone has different tastes, so if this is not for you, that is totally fine. However, if you can get past the aesthetic issues, this is definitely a great natural toothpaste that you can feel confident using on your teeth. PerioBrite Natural Toothpaste is definitely a natural toothpaste we can recommend, and it makes sense why it is so popular. Right now, you can grab a pack of 2, 4 ounce tubes of PerioBrite's Cool Mint for $7.98 on Amazon. Or you can choose from their other two flavor options. For more information about the best natural toothpaste, head on back to Green and Growing. Here are some top questions that I found for people seriously considering buying PerioBrite Natural Toothpaste. Is this toothpaste suitable for sensitive teeth? The company says yes, but to be safe, consult with your dentist before using. What color is this toothpaste? It is not white like most commercial brands. Instead, it is dark beige, which is why some have issues with the look. Related Article: Best Natural Toothpaste: Our Picks to Keep your Smile Bright!